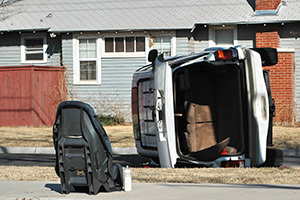 When a vehicle rolls over, the passengers are in danger of serious physical injury. Sadly, if children are inside the automobile, they may experience even worse consequences during this devastating type of collision. Even with child car seats, seat belts, and other safety devices, a rollover accident can lead to permanent disability or even death of children onboard the vehicle. Sport utility vehicles experience rollovers much more often than all other types of automobiles and may be the biggest threat to the safety of passengers. If you or someone you love has been the victim of an SUV rollover accident, you may be able to take legal action against the responsible party. Contact the SUV rollover accident lawyers of the Willis Law Firm at 800-883-9858 to discuss your case with a member of our qualified legal team. Children should not have to sacrifice their futures because of the careless behavior of another, and any acts of negligence that lead to their harm should be met with aggressive legal action. Anyone that has been involved with an SUV rollover accident understands the dangers of this type of event. If you or someone you love has suffered from a rollover or if you have seen your children undergo this type of trauma, contact the SUV rollover accident attorneys of the Willis Law Firm today at 800-883-9858 for information about our services and the many ways we can help you.